Successfully Added IP67 Bluetooth Wireless Keyboard - Supports PC, Mac, Android + IOS, Flexible Foldable Silicone, Waterproof, Dirt + Dustproof to your Shopping Cart. IP67 Silicon Bluetooth Keyboard that supports s full range of devices for great compatibility and portability. 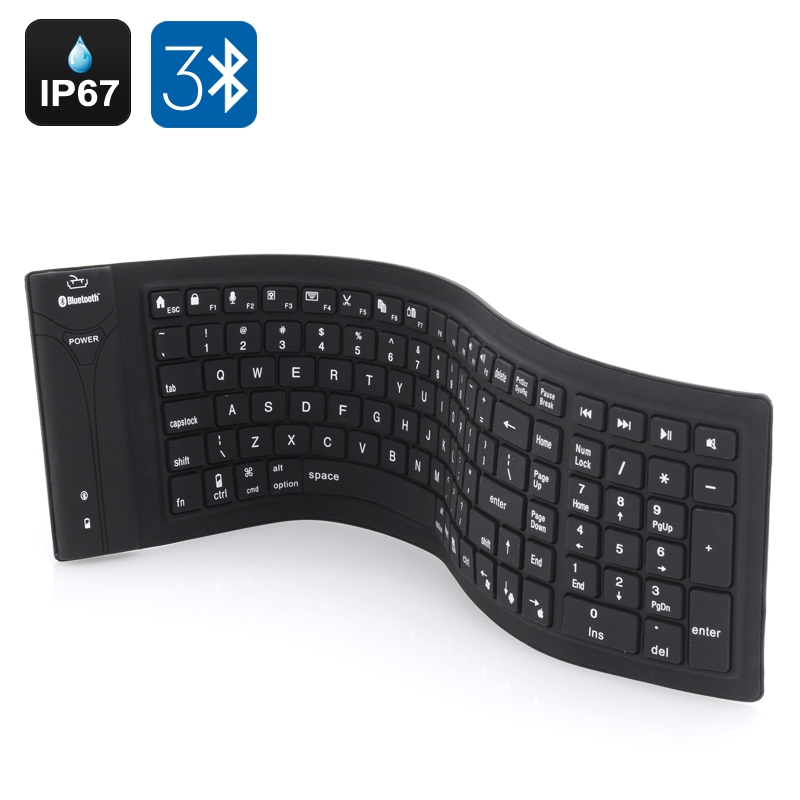 Flexible Bluetooth silicon keyboard is great for use at home the office or on the go. It’s compatible with Windows and Mac computers as well as Android, iOS and windows mobile devices so can be used on a range of products. It’s an extended QWERTY keyboard design with a num pad and quiet key stokes to avoid disturbing those around you. The Silicon rubber outer makes it waterproof, dustproof and very durable so cleaning and looking after it is easy. It rolls down to a compact 13 by 8 CM cylinder so it can fit in your pocket or bag and at only 165 grams it’s exceptionally light making it exceptionally portable so you can have access to a keyboard for all your devices wherever you are. Its can fully charge in a few hours and has a standby time of up to 30 days so you can get plenty of use between charges. This product is in stock now, we guarantee next working day shipping and offer a 12 months warranty on all our products. Brought to you by the leader in electronic devices and wholesale computer accessories, Chinavasion. Please read saftey caution and storage notes in the user manual before using so as to get the most from the keyboard and look after it correctly.